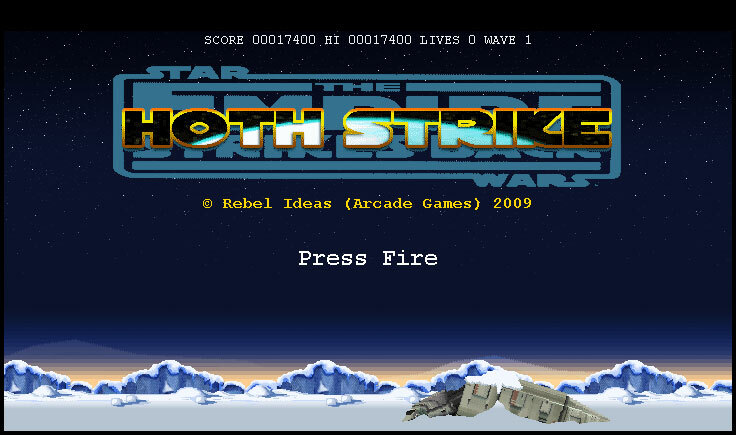 Scattered throughout the icy wilds of Hoth are remote rebel outposts that double as safe havens for stranded pilots. Sadly since the initial AT-AT strike on the rebel base all communication has been lost to the outlying sectors. Dozens of rebel pilots are lying stranded with no hope of survival ! Worse still the Empire has launched a calculated attack on Hoth to eliminate any surviving rebels and time is running out to rescue your comrades. You must fly with caution between the numerous outposts rescuing pilots and destroying every trace of imperial aggression. To pick up a rebel pilot simply fly your speeder directly over them. They will hold on to the speeder until you fly them over the rebel outpost. If you fail to rescue a single rebel pilot you will lose and the game will end. Rebel intelligence has gained valuable information on the enemy. Floating spy probes with semi-intelligent targetted laser bombs. Pest probe that hones in on stranded humans and carries them away producing..
..an awful hybrid of twisted metal and human flesh. Mutants turn innocent humans in to rabid killers and will pursue the player across the landscape ! Dumb “mother” probe with no weapons just a belly full of radioactive baby pods. High energy balls of alien waste that bounce around the level until they collide with the player. As always I encourage anyone wanting to play my arcade games to download and use Google’s Chrome browser. It’s quite possible that the game will run like a dog on your machine. If that is so then please let me know you system spec. The game is capped at 24 FPS. You wouldn’t believe how long it’s taken to get that wonderfully smooth spaceship-gliding-left-and-right at the touch of a button polished. The result is quite simply stunning. In a departure from Defender I have also included bombs as well as super fast lasers. I am so excited about this game just now and think it will be enormous fun to play. Growing up in the late 1970’s early 1980’s I experienced first hand the wonder and amazement of early home computers. In the beginning I got hold of a ZX81 and pretty much played every available game on it. I still remember being terrified at 3D Monster Maze. Galaxians, Pole Position, Star Raiders… they were all there and all utterly fantastic. Atari were synonymous with arcade gaming and I was instantly smitten with them. So much so that I saved up dinner money to buy the magazines of the day that carried program listings. This was to be my way in to programming my own games. Atari BASIC worked. It wasn’t so clumsy as people though in hindsight and allowed you to generate sound and colourful graphics with reasonable ease. I devoured countless magazines worth of code and before long had my own library of BASIC arcade games running on the Atari. I saved them to cassette and took them to the local computer store to show the store owners who myself and my friends had got to know quite well. The largely favourable comments I recieved urged me on and I soon knew that a life of games programming was for me. Sadly education, girls, work and all other stuff got in the way and my Atari gathered dust before finally being “given away” by my Mum. By the time that happened I really didn’t care so much such were the demands of my life at the time. This personal expression is important to me and right then I considered the fact that it might just be valuable to thousands of other like-minded game designers out there. I’m currently looking for a publisher willing to take a chance on it just now. If you’re a publisher and like the idea of a book that taps in to the huge combined market of web designers and arcade game enthusiasts then please drop me a line. It’s been a couple of months since I updated this so I figured I should write a little something about my IFM follow up. I currently call the game Mutant Mayhem which I admit is purely naff but the thing is you need a name for your game when you start out or it just gets called “GAME” and that doesn’t really inspire me to move it forward. So I ripped the core of IFM out and reworked it to handle a scrolling environment. I actually didn’t need to put much effort in to it to be honest since the game is designed to handle countless “sprites” at once. Collision remains an issue but in terms of stitching tiles together and handling alien movement it was very straight forward. The player controlled ship remains central in the screen and currently moves in 8 directions. 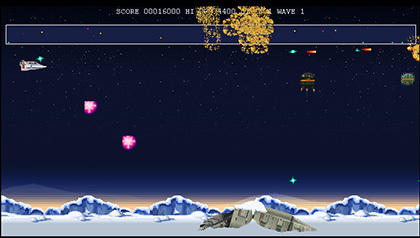 The fire button spits out a fireshot in the direction that the player is facing and alien collision is handled as in IFM (including the same recoil from the alien). There is so much to work out in this game and I suspect that I will wind up creating a web based game/sprite editor to manage the content. For the last few months I’ve been developing an arcade game in the style of the games I adored as a child. That means colour, action, fun and all things Atari / Nintendo packed in to one game. As with all my favourite games the objective is to wipe out the bad guys with lasers and achieve the highest score possible. Invaders from Mars is the first in a series of games that I aim to create and I already have some firm designs for the next game. I hope you enjoy playing Invaders from Mars as much as I enjoyed crafting it. I always welcome feedback and reply to any mails. I heartily recommend Google’s Chrome browser for the best game experience. The game should work in all browsers. Please let me know if you have problems.